Roscommon 2-4 Mayo 3-4 (Castlerea, 28/6/1931). MAYO: T Burke; J Kenny, S Moran, P Hoban; T Tunney, S O’Malley, M Mulderrig; P Munnelly, J Forde; P Kelly, J Culkin (1-1), G Courell (2-2); P Moclair (0-1), M Moran, J Carney. SEMI-FINAL: Mayo 3-5 Galway 1-4 (Castlerea, 5/7/1931). MAYO: S Moran; J Kenny, P Quinn, S Curran; T Tunney, M Mulderrig, S O’Malley; S O’Dwyer, P Flannelly; J Forde, J Culkin (1-2), P Hoban; G Courell (1-1), P Moclair (1-2), M Moran. FINAL: Mayo 2-10 Roscommon 3-2 (Sligo, 9/8/1931). MAYO: S Moran; J Kenny, P Quinn, P Hoban; T Tunney, S O’Malley (0-1), J Egan; M Mulderrig, P Flannelly; J Forde (0-1), S O’Dwyer (0-1), M Moran (0-1); G Courell (2-3), P Moclair, J Culkin (0-3). Mayo 1-5 Galway 0-7 (Ballinrobe, 4/10/1931). MAYO: S Moran; J Kenny, P Quinn, J Egan; T Tunney, S O’Malley, P Hoban; M Mulderrig, P Flannelly (0-1); J Forde, S O’Dwyer (0-1), M Moran; G Courell (1-3), P Moclair, J Culkin. Kerry 2-4 Mayo 1-4 (Croke Park, 25/10/1932). MAYO: S Moran; J Kenny, P Quinn, J Egan; T Tunney, S O’Malley, P Hoban; M Mulderrig, P Flannelly; J Forde, S O’Dwyer (0-1), M Moran; P Moclair (0-1), P Kelly, G Courell (1-2). SEMI-FINAL: Galway 1-3 Mayo 0-10 (Tuam, 20/8/1931). MAYO: O’Gara, Concannon, Brennan, McNicholas, Irwin, Shields (0-1), Moran, Joe McGowan, Laffey, Kenny (0-7, one free), Stenson, McHale, Ruddy (0-1), Flannelly (0-1), James McGowan. FINAL: Mayo 2-7 Sligo 0-3 (Roscommon, 23/8/1931). MAYO: J Irwin (capt. ), J O’Gara (goal), P O’Loughlin, J Brennan, A Crean, P Concannon, J Shields, P Laffey (0-1), Joe McGowan, H Kenny (0-1), M Brannick, T Ruddy, James McGowan (0-3), J Flannelly (1-2), M McHale (1-0). SEMI-FINAL: Kerry 3-11 Mayo 0-2 (Tuam, 30/8/1931). Mayo scorers: Healy and Kenny (0-1 each). Last year Mayo minors won the Connacht Championship and were unluckily beaten in the all-Ireland final by a single point. This year, owing to an extraordinary set of circumstances, the Connacht Council up to a fortnight ago had not arranged a single fixture for last year’s victors. 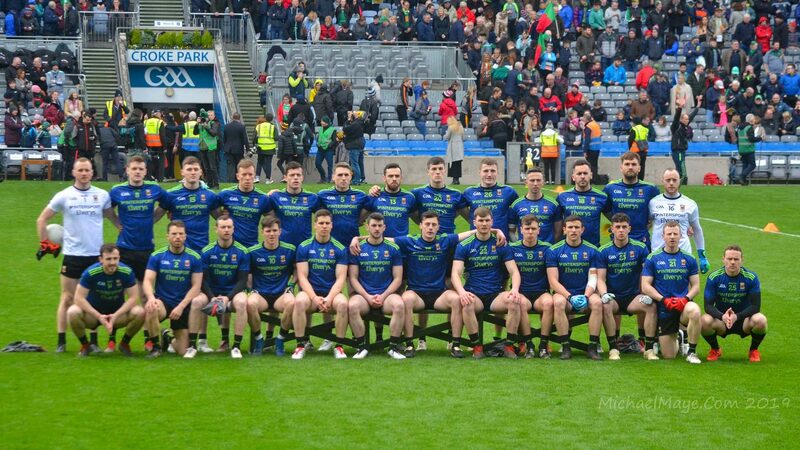 Roscommon, Leitrim and Sligo had played their ties in the Provincial Championship and it looked as if the interests of Mayo were to set at naught, and that the Council would be free to nominate a team to meet the Kerry minors in the all-Ireland semi-final. However, at a meeting of the Connacht Council at Sligo, two fixtures were arranged for Mayo, the first against Galway at Tuam last Thursday, the 20th inst., when Mayo scored a well-merited victory by a margin of four points. With only three days’ rest they had to turn out on Sunday at Roscommon to meet Sligo in the final of the Connacht Championship, achieving another victory by the 13 points to 3, thereby establishing themselves as Connacht champions and qualifying to meet Kerry minors at Tuam next Sunday in the semi-final for the all-Ireland championship. The achievement of the Mayo boys is without precedent in GAA history, inasmuch as within four days they achieved the unique distinction of winning two matches, and establishing themselves champions of the province. Sources used: Padraig Ferguson’s Archive, The Road to 51, Western People, Mayo News, Connaught Telegraph.